Descubra Goa en una excursión privada de un día completo con su guía personal. 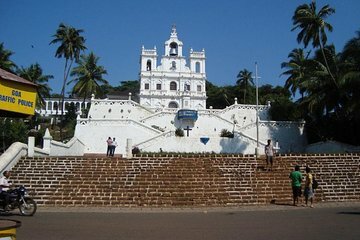 Conozca la historia y la cultura evidente en sitios como Old Goa (Velha Goa), Patrimonio de la Humanidad de la UNESCO, Templo Mangueshi, Templo Shanta Durga, Barrio Latino en Panaji, pueblo Dona Paula, y la capital del estado, Panjim City. Su tour con todo incluido incluye almuerzo en una plantación de especias, guía privado y transporte con aire acondicionado, entradas y recogida y entrega en el hotel. Explora una de las regiones más sorprendentes de la India. El tour con todo incluido incluye guía privado y vehículo, entradas y recogida y devolución en el hotel. This is a great way to see Goa if you only have a day or if you want to get your bearings on your first day. Brief stops at all the highlights. We had a great time, and our guide Ryan was very knowledgeable. The lunch at the Plantation was delicious and the place was very nice. The cathedrals he took us to see where breathtaking! He was very knowledgeable of the places. Picked us up and returned us on time. Was a great guide and good driver. Loved it. Went for the Heritage experience and i was very pleased with the overall tour. The guide, Mr. Agnelo Ferrao, was not only nice and helpful, but also extremely knowledgeable of all the details about the sites we visited. This was indeed a private tour, which seems costly for one when you look at the price - but the experience was surely worth it. i would definitely use their services again. Our tour of Goa was average. The city of Panjim is about 45 minutes from the cruise port and with all the construction, in an old van with tight seating seemed like a long ride. Our guide spoke very broken English, talked more to the driver than us and was very hard to understand. Our lunch at the Spice Plantation was ok, not on a palm leaf and thought we would be seeing the actual fields of spices not a tourist loop in their yard showing the different spices growing. When we questioned the guide, he said that there were a lot of spice plantations we didn't get the experience that we were expecting as was represented on Viator.....The one bathroom stop was at an expensive antique dealer...whom the guide knew very well. Tour was overpriced. Did this as a shore excursion from Mormugao Port. Excellent day and much more seen and learnt than the overpriced cruise company option. The visit to the Spice plantation with the lunch included was the highlight of the trip. The tour guide in Goa, Anand was very good also the driver, Victor. He explained so many things about Old Goa, and we could visit so many churches around Bom Jesus, where St. Franciscus Xavierius 's body was kept in this church. The opposite of the Bom Jesus, there are St. Catherine and St.Peters and others. After that we visited the temple and the spice plantation for lunch. After lunch, our request to skip the spice plantation tour, on the way back we stop to St. Mary Immaculate before we go back to the hotel. Spice Plantation visit as well as included lunch was a good first time experience with a lot of insight into different spices and how they grow. A must-see when visiting Goa. The tour was great. My tour guide Ryan, had extensive knowledge on Goa and the history of Goa which was exactly what I was looking for. We covered off the main spots in Old Goa and the tour of the spice plantation was great too. The only thing I would comment on would be the cost of the tour. It was 200 USD all up which I feel is slightly steep, in saying that it was a private tour and I was by myself. Otherwise I had a great time.